Description Game Description: Help our hero fight through action-packed levels and reach the top of the tower where the final boss awaits him. 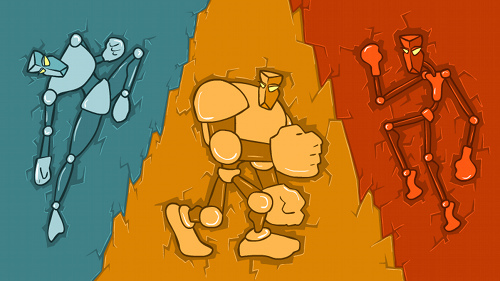 Transform into 3 different robots as you play! Unlock 18 special abilities that will help you in your quest! There are 16 achievements to be completed, go get them! It's a very challenging game, but by collecting achievements you gain more lives when you start the game. There is a Tribopedia section which explains important aspects of the game in more detail. Now, go and fight!